On April 20, 1999, I was home sick with the flu. At the time I taught English at a private high school in Minnesota, and as I dozed on the couch, my mindless TV programming was suddenly interrupted by news of a shooting at a high school in Colorado: the Columbine massacre. I spent the day weeping, unable to imagine the horrors in Colorado. 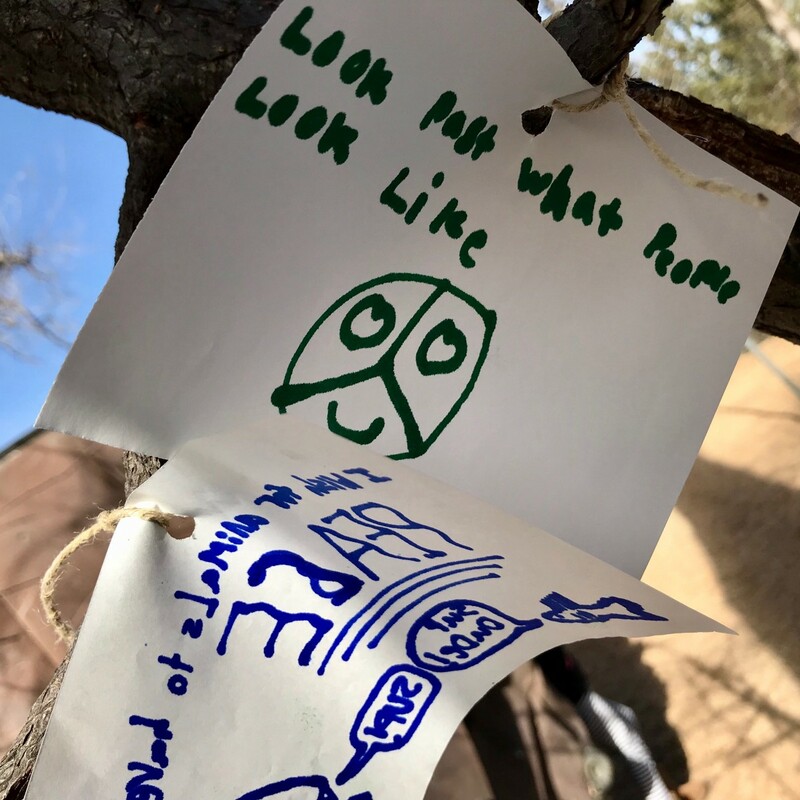 I reflected on my own students, their parents, my colleagues. And I thought: this is a horrible, once-in-a-lifetime event. But, today I walked out. Today, nearly nineteen years later, I joined my child and the entire student body and faculty of his school, and we walked out together. 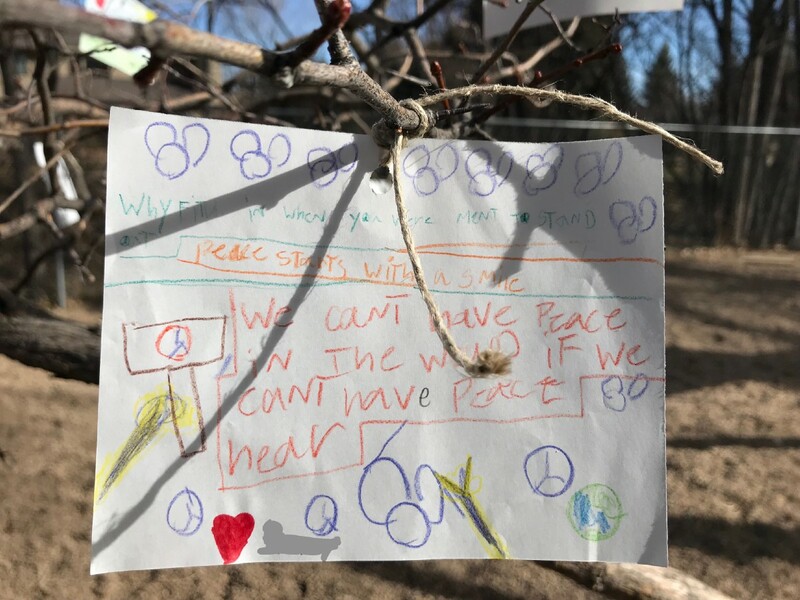 The students of this intentional and thoughtful elementary school each wrote a wish for peace which, when we walked out, they tied to the trees and fences of the playground. 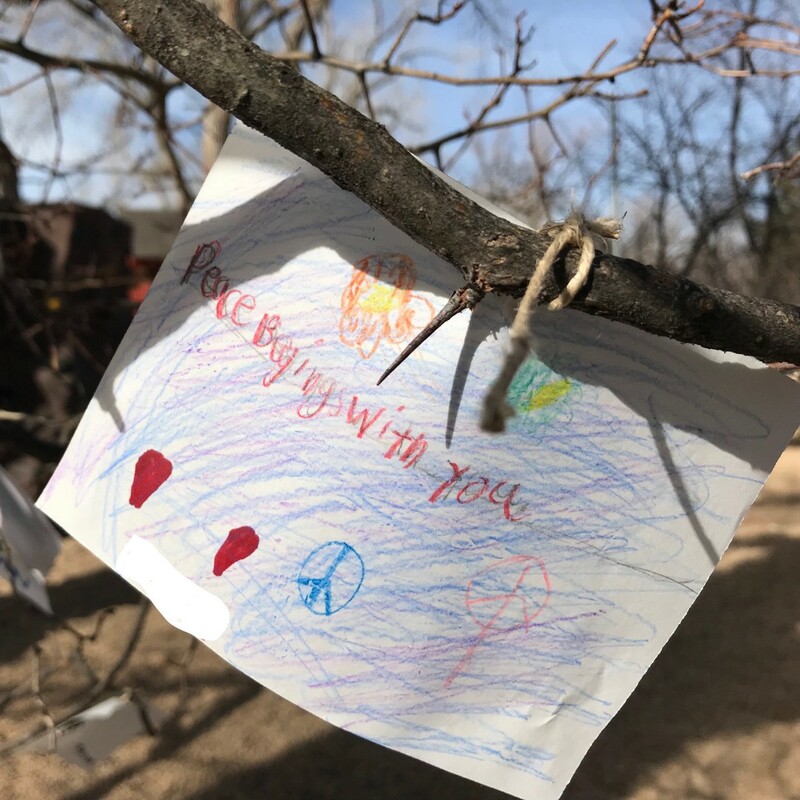 Their messages of hope and love for the world brought me to tears as I helped their little fingers tie the twine. These aren’t platitudes. 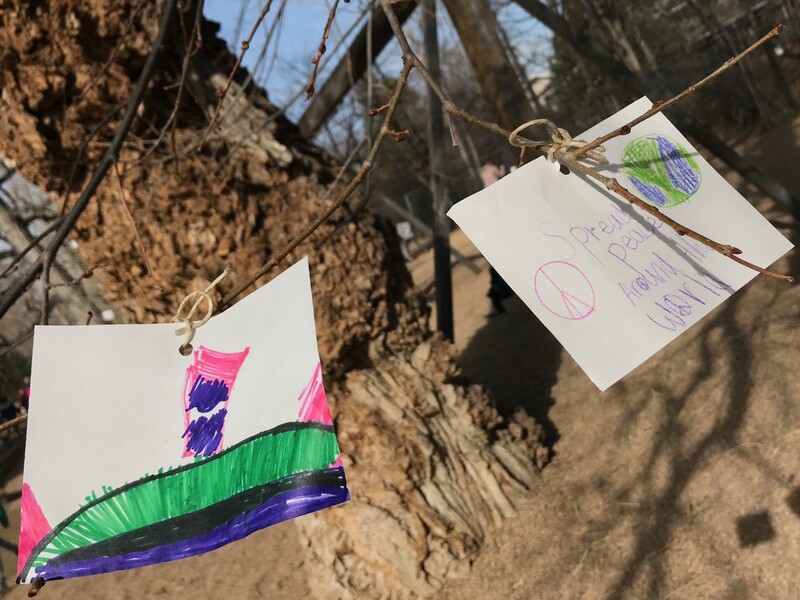 They are cries from children working to understand and create peace amongst themselves every day. My child is too little to understand why today’s protest happened. He knows nothing of school shootings, yet. But I am sure the older children at school today knew exactly what this was about. And lest you argue that children have no place in politics, I will remind you that at the signing of the Declaration of Independence many of our founding fathers and mothers, including Alexander Hamilton, were mere teenagers themselves. Change is often led by the young, and we all benefit. The young people of Marjory Stoneman Douglas High School in Florida do not surprise me. Carrying them in my hearts, today I walked out. For nineteen years, we have been begging. It became clear that Columbine was not a one off. The list of school shootings and massacres that have followed grieves me deeply. Indeed, even after Newtown, a shooting in a school not unlike my child’s school, it became clear that our political leaders love and value guns and gun money over people. No teacher should have to choose between their own safety and the security of their family and that of their students. No student should go to school in fear that a classmate will mow them down at lunch. No child should have to do active shooter drills along with their fire and tornado drills. And no parent should ever see on the news that a shooter has invaded the sanctity of their child’s school. So, today I walked out. We have too many guns. Buying a military weapon is far too easy. We have schools that are failing their children. We need more access to mental health care. We need better interventions by local police. All of these statements are true. All of them. But here’s the thing: my friends in Europe and Canada and Australia and Japan don’t fear for their child’s safety at school. People are mentally ill at the same rates in other countries. People play violent video games across the globe. Schools have problems in other countries. There are angry and depressed teens in other countries. Ours is the only country where guns are so easily accessible. Guns are the problem. That’s why today I walked out. I walked out for my child and his friends and teachers. I walked out for my nieces and their school communities. And I walked out for your children and their schools, too. What we are currently doing does not work. We need real change. And evidently our elected officials won’t take that change seriously, but the coming generation of voters — a generation that has never known life without school shootings — they are demanding change. And I am marching with them. Enough is enough. Indeed. What a goodly thing. But peace is hard work. And walking out is the first step. So today I walked out holding my child’s hand. In peace.